O’Brien felt a deep spiritual connection to the Greek island of Skyros, appreciating in turn the piousness of the villagers within their Orthodox Christian religion. Having turned away from both his strong Irish Catholic faith and the narrative scenes of his early career, for example the inaugural Blake prize-winning painting, Virgin Enthroned, 1950–51, O’Brien increasingly painted genre scenes, all the while retaining the sumptuous detail and rich colour of his religious works. 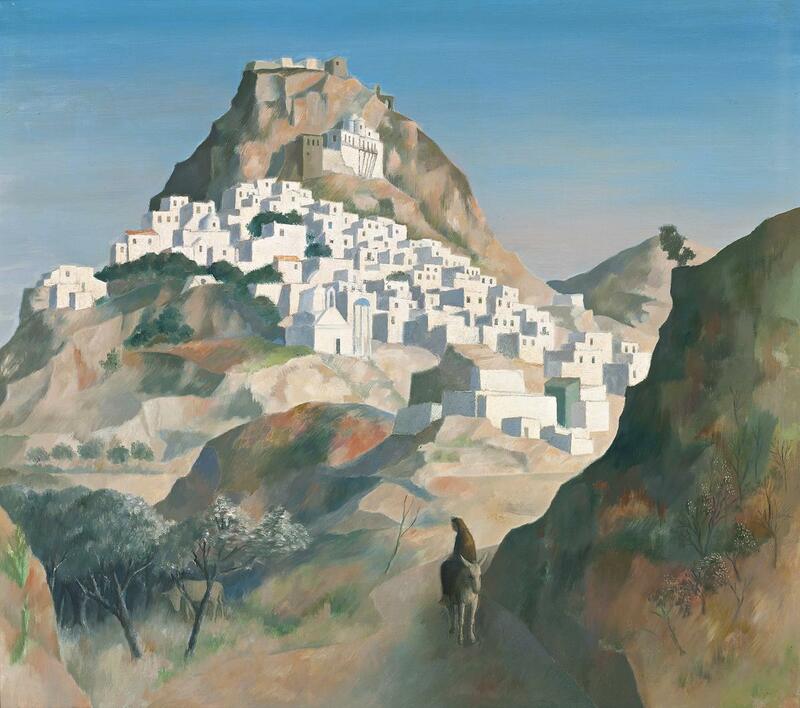 In this scorched landscape, the Monastery of Saint George and white Skyrian houses cling to the steep sides of the mountain at Chora, a view that would appear many times in O’Brien’s oeuvre. A detailed pen and ink sketch of the same vista even graced the cover of the 1968 Macquarie Galleries exhibition catalogue in which this painting was first exhibited. While glimpses of the view are revealed through open windows and doorframes of the artist’s fisherman’s hut, schematic sketches of it make up the modern-day backdrop of religious processions and narrative scenes – none of them have the unwavering attention to colour and form present in Skyros Evening I. Using the physical depth of field that the landscape provided, O’Brien systematically built upon planes of green, red and brilliant white paint, creating peaks that reached up to the heavens. The feathery brushstrokes of the foreground provided a counterbalance to the silvery leaves of olive groves and the dusty scrub on the edge of a beaten mountain track. At first glance, this work is a simple landscape painting, an expression of the enduring beauty of the Greek countryside. Closer attention will reveal the silhouette of a hooded figure atop a donkey in the foreground, the viewer’s eye drawn down to its presence by a stark jutting edge of the mountain in the lower right hand corner. Those well versed in Christian iconography will identify this figure as a solitary Virgin Mary on her flight into Egypt. The story of the Flight into Egypt was a subject favoured by early Baroque painters, as it gave them considerable artistic license to paint large vistas of landscape whilst staying true to the religious constraints of their commissions. The resulting works are often amusing to modern day viewers in their anachronistic and geographically incongruous views of an ancient middle-eastern setting. However, in addition to being faithful to his geographical and temporal setting, O’Brien avoided clear reference to this scene as a Biblical episode, leaving interpretation of the painting open to each viewer – a design made all the more clear in the artist’s choice of title for this work.